Read our helpful guide to second hand Fiat Croma. AA Cars works closely with thousands of UK used car dealers to bring you one of the largest selections of Fiat Croma cars on the market. You can also browse Fiat dealers to find a second hand car close to you today. 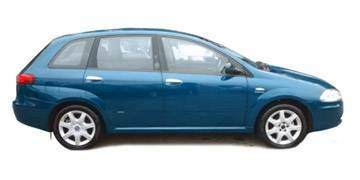 All used Fiat Croma on the AA Cars website come with free 12 months breakdown cover. The Fiat Croma name was first seen in 1985 when it was used on a five door family hatchback, but in 2005 it was re-launched as a MPV-hatchback crossover with plenty of space and agile handling. Its five seat cabin is comfortable and roomy, while its good finishings and well-equipped dash are closer to what one might find in a car with a more luxurious and desireable badge. The 1.9 litre diesel is the best power option, and boasts impressive performance (130mph top speed and a 0-62mph sprint in 9.6 seconds), while handling is calm and tight. Refinement and ride doesn?t quite live up to its rivals, but overall there is little to detract from the Croma?s calm, and often overlooked, excellence.